THE SPICIEST SALSA NIGHT launching party to date! 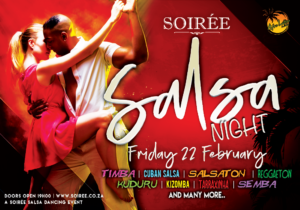 That’s right, get your dancing shoes SALSA ready and step into our SOIRÉE HOUSE where the party never stops! Dress code: you heard the theme… Dress for a SALSA FIESTA! Advanced, intermediate, 2 left feet… it doesn’t matter, all that matters is that you love to dance and meet beautiful people! Bring a partner, bring a friend, gather your crew and let’s SALSA!